Just like the many different landscapes, Bhutanese cuisine is just as varied and splendid and every region knows its own speciality. Dairy foods, in particular butter and cheese from yaks and cows, are very popular. A lot of meat and poultry like chicken, pork, beef, goat, mutton and yak is consumed, as well as fish. These are usually served in the form of stews (tshoem), with in it a wide variety of fresh vegetables and spices like cardamom, ginger, caraway and turmeric. All meals are accompanied by white rice (ha chum) or pink-red rice (eue chum), which is steamed or boiled. Besides rice also buckwheat and maize are used. If there’s one thing typical for Bhutanese cuisine, it is that the Bhutanese love it spicy! Chillies are not considered to be a seasoning, but a true and valuable vegetable. 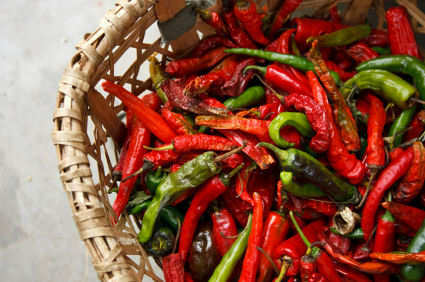 Therefore traditional Bhutanese food is lavishly spiced with dried or fresh red and green chillies. How can it be any other way than that Bhutan’s favorite ingredient is processed in its national dish? While in Bhutan, you ought to try the national dish of Ema-Datsi, consisting of ema (chilli) cooked in datsi (cheese). Everybody has their own interpretations of this recipe and it will excite your senses for sure! If you don’t like it so spicy, don’t be worried. Most of Bhutan’s professional chefs take into account the Western less spicy taste. You can choose from Continental to Chinese, and from Bhutanese to Tibetan and Indian cuisine. Most hotels offer dinner in buffet style. Although (sweet milk) tea is a popular beverage in Bhutan, most people prefer Sura. This saltered butter tea is served on all social occasions. Regarding water, you should better not drink tap water, but choose mineral water. During trekkings the water is boiled and therefore safe to drink. Regarding alcohol, the chang (local beer) and arra (a spirit distilled from rice, maize, wheat or barley) are common and very much favored. They are easily available in bars, exept on Tuesday (dry day). The legal drinking age is 18 years and above. Doma (betel nut) is offered as a customary gesture of greeting. Since 2004 Bhutan is the world’s only country where public smoking is prohibited. If you’re a smoker, you’re allowed however to import tobacco to use indoors, but you have to pay an import tax of 100%. Tip: when you’re offered food, you can say “meshu meshu“, covering your mouth with the hands in refusal according to Bhutanese manners, and then give in on the second or third offer. Or check http://www.asiarecipe.com/bhumain.html for Bhutan meat dishes recipes.